While doing research for the WWII novel I’m currently writing, I often find information of little remembered history from WWII. I recently learned of the Friendship Train sent to France and Italy following the war. Much of Europe was devastated during WWII and following the war, the people continued to suffer years of deprivation, limited food supplies and a slow reconstruction of their towns. While Drew Pearson, a popular journalist of the time, visited Europe during 1947, he heard that the Communists were being thanked for sending a few carloads of grain to the Europeans. Feeling that the United States could do more to help our European neighbors; he conceived the vision of the Friendship Train. His suggestions appeared in his newscast columns on October 11, 1947. He asked our citizens to donate food and clothing to help the people of France and Italy. I’m sure he must have been amazed at the response to his request. 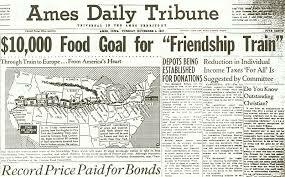 Immediately, towns, cities, and the citizens of every state in the USA collected food for the Friendship Train. The plan was met with such enthusiasm that competition among the communities, counties, and states began for collecting and sending the largest contribution. Five weeks later, on November 7, 1947, the Friendship Train began its trek beginning in Los Angeles and ending in New York City. Although the train traveled through only eleven states, every state sent boxcars or trucks filled with goods to meet the Friendship Train at a junction. When it arrived in New York, we had collected and shipped $40 million in food and supplies to Europe aboard the 700-car American Friendship Train. No money was ever spent in the process. The transportation by rail and truck, the loading of the boxcars and trucks, the loading and the use of the ships was all provided by volunteers and donations. The train's mission was an incredible display of goodwill from the people of the United States to France and Italy. Every package had this label: "All races and creeds make up the vast melting pot of America, and in a democratic and Christian spirit of good will toward men, we, the American people, have worked together to bring this food to your doorsteps, hoping that it will tide you over until your own fields are again rich and abundant with crops." Also on every label were these words, "This gift is sent to you by: 'first and last name and address of donor.’” This message was written in Italian and French and printed beside the American flag. In 1949, France reciprocated by collecting 49 boxcars full of gifts donated by the French citizens and returned to the USA in their Merci Train as a thank-you for our generosity. One boxcar went to each state. Upon arrival, the gifts were distributed in various ways. Some freely given, others auctioned off and many items placed in local museums. The boxcars, called 40 and 8 boxcars were vintage, having been used to transport troops during WWI and then again during WWII. Many veterans remembered being transported across Europe in these boxcars. The Merci Train cars were restored and kept in museums across the country as memorials to those who had fought and died. Most of these boxcars have survived, many now over 100 years old, and are on display in museums in 43 states. More information about the Friendship Train and the Merci Train can be found on the internet. 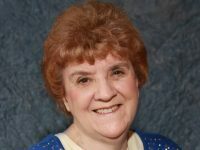 The novel: Authors write from our hearts and can’t help but inject many of our own ideas, humor, personality, fears or interests into our characters, particularly the protagonist. 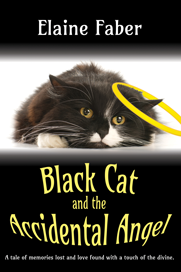 Though limited to the physical capabilities of a feline, Thumper, the cat in the Black Cat Mysteries, is best described as having human emotions, thoughts, ideas, and knowledge. With this in mind, Thumper, therefore, is much of me. >As a POV character in Black Cat’s Legacy, Thumper has waited for someone to return to solve the cold case murder from 25 years ago at the lodge. 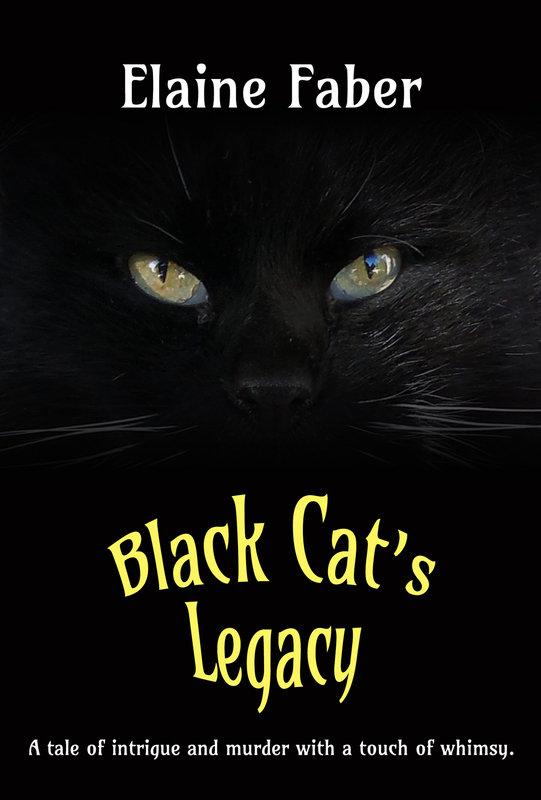 With the aid of his ancestors’ memories, he points out clues to help Kimberlee and her associates solve the mystery. Of course, someone stands in the way and creates chaos. 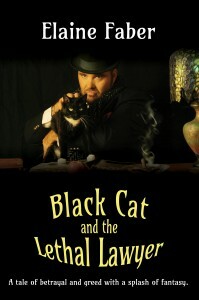 Throw in a bit of romance and intrigue, a touch of espionage and a smidgen of fantasy and you have a real page turner. The sequel: The author engages in a clever dance, writing a sequel to create what happens next. Assuming a mixed audience of fans from our first book and new readers starting with book two, we must give enough of what happened before to understand why this and that is happening in book two without spoiling book one. 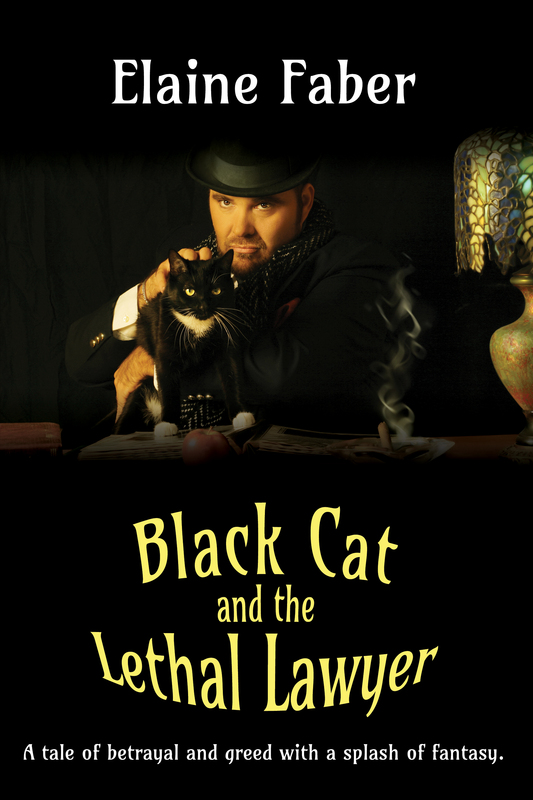 Thumper plays a bigger POV role in the sequel, Black Cat and the Lethal Lawyer. By meeting his soul-mate, Noe-Noe, a cream tabby with eyes the color or mustard and stripes the color of marigolds, he has opportunity for more POV scenes and humorous conversations. Set on a Texas horse ranch, Thumper must stop a killer bent on harming Grandmother, even though he doesn’t like her very much as she has her own wicked agenda. The third in the series: The third novel in a series must tie up all the loose ends within the three books, leaving the reader contented with the conclusion. As authors, we must answer all the questions satisfactorily and yet leave just the hint of a possible future plot. What’s next? 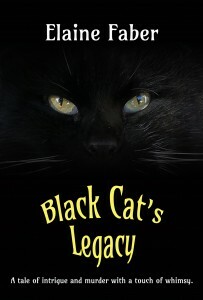 In spite of my intention that my journeys with Black Cat are finished, one never knows what tomorrow brings. After all, as the muse for his character, he still lives within me, kicking and screaming to get out, wanting to share yet another adventure, even as I turn my attention to another series set during WWII.